The only visual difference between the two watches is the buttons: The Versa has three and the Versa Lite has one. It’s a simple change that actually improves on the Versa’s navigation, and speaks to Fitbit’s philosophy for its new low-cost model: Less doesn’t have to be worse. In fact, none of the missing features in the Versa Lite are central to the experience, and for most buyers the decision between the two models will be an easy one. 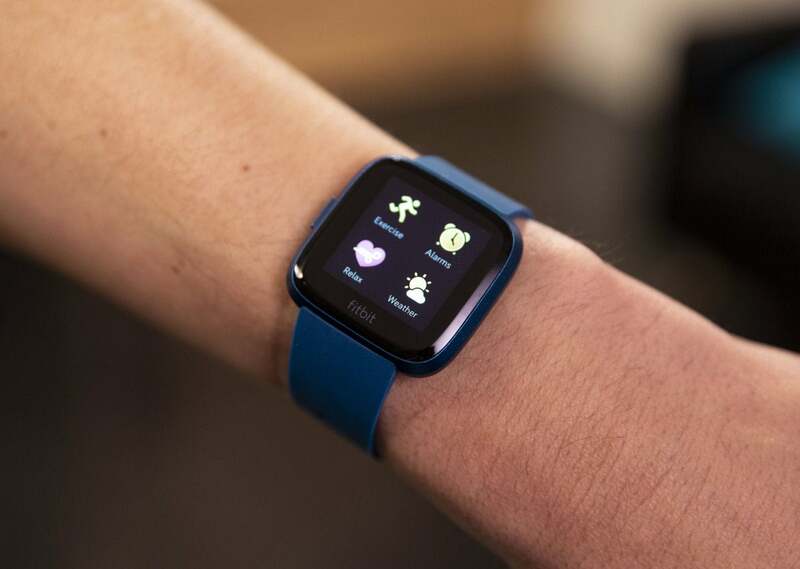 Unlike the choice between a 3rd- and 4th-gen Apple Watch or even Fitbit’s own Inspire and Inspire HR, the differences between the Versa and Versa Lite give the two watches their own identity without crippling the experience for buyers on a budget. There isn’t much to say about the Versa Lite’s design that I didn’t write in my original Versa review. It has a nice fit that isn’t too bulky on my wrist, though I wish the bezel around the screen was smaller and more uniform. 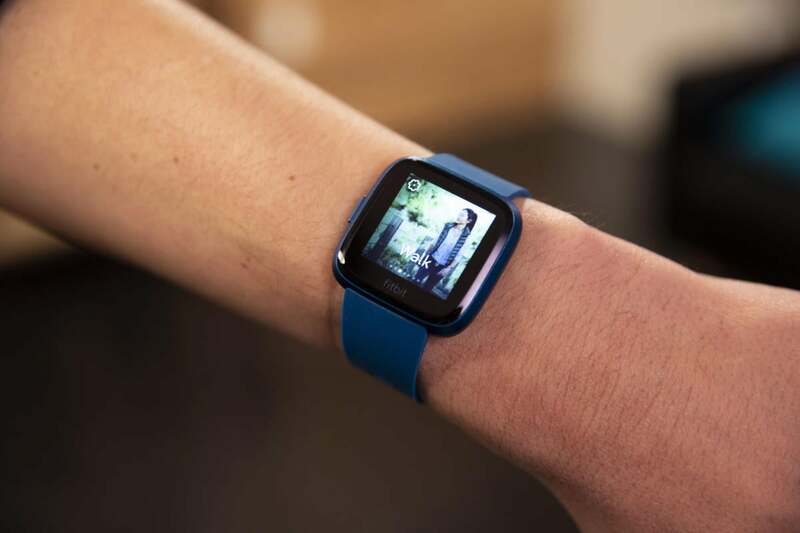 As it stands, the bottom edge is large enough to fit the Fitbit logo, which cheapens the look somewhat when compared to the Apple Watch and other slim-bezel circular watches. The Fitbit Versa and Versa Lite have the same heart-rate monitor. 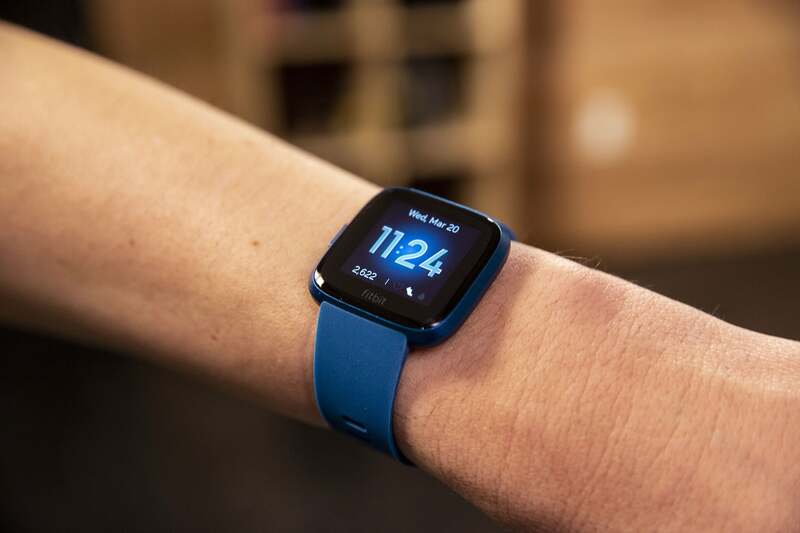 The two new colors give the Versa Lite a less-premium feel as well, even though they use the same aluminum frame as the more-subdued silver model. It’s not they don’t look good, but something about wearing a bright blue or pink watch with a matching band doesn’t exactly scream luxury. Swapping out the band with one that doesn’t match the color exactly helps some, but my guess is that the silver model will be the most popular by a wide margin. Even with the new Crayola-inspired palette, the Fitbit Versa Lite still looks like a solid wristwatch that costs far more than its price tag. I’ve used plenty of watches and trackers in this price range that look feel plastic toys compared to the Apple Watch, but the Versa Lite can stand up to any other smartwatch I’ve used, even those costing more than twice as much. 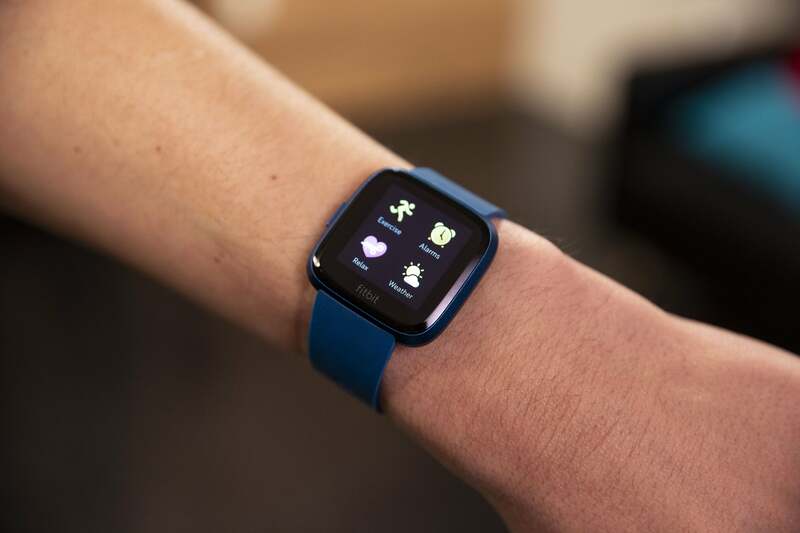 The Versa Lite’s single button has just three functions: turning the screen on, turning it off when on the clock, and going back on any other screen. That’s undoubtedly a dumbing-down of the original Versa’s three-button design, but it makes navigation and usability that much better. It was never all that clear what the two buttons did, and not having them eliminates a layer of unnecessary complexity. 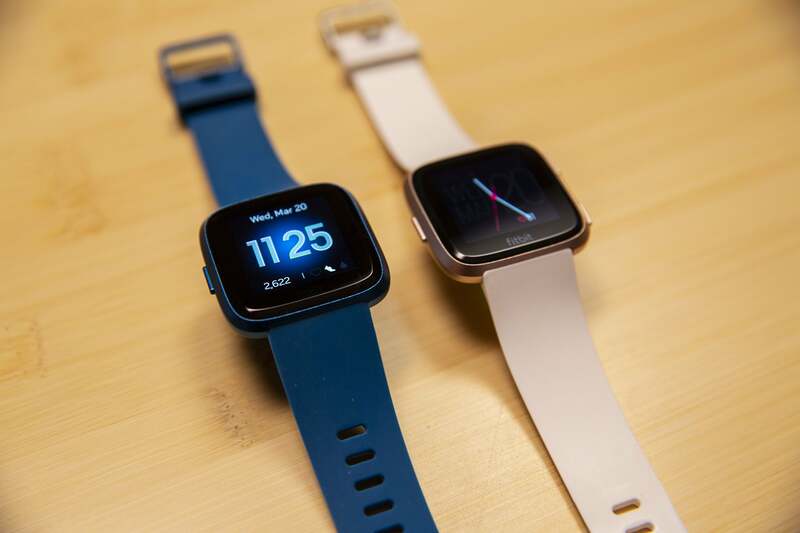 You won't miss the lack of side buttons on the Fitbit Versa Lite (top). Of those five, the altimeter, on-screen workouts, and enhanced swim tracking are only going to matter to hard-core athletes, and they’ll likely want to spring for the Ionic anyway. I thought Wi-Fi would be an issue, but as it turns out, the Versa doesn’t rely on it all that much. Fitbit told me that Wi-Fi is mainly used for music transfers on the higher-priced watch, and since the Versa Lite has no storage, the Wi-Fi chip isn’t necessary. I was skeptical, but day-to-day functionality, notifications, and Android quick replies all worked just as well as they do on the regular Versa, even when my phone was further than a few feet away. The lack of music storage wasn’t really an issue for me either, since the Versa Lite can still control the music playing on your phone. I’m not one to care much about storing music on my watch, and Fitbit’s uploading interface isn’t the friendliest to use. Since my phone is more than likely to be around when I’m out and about, controlling my Spotify or Apple Music streams is perfectly fine. Elsewhere, the Fitbit Versa Lite is just as capable as the Versa. 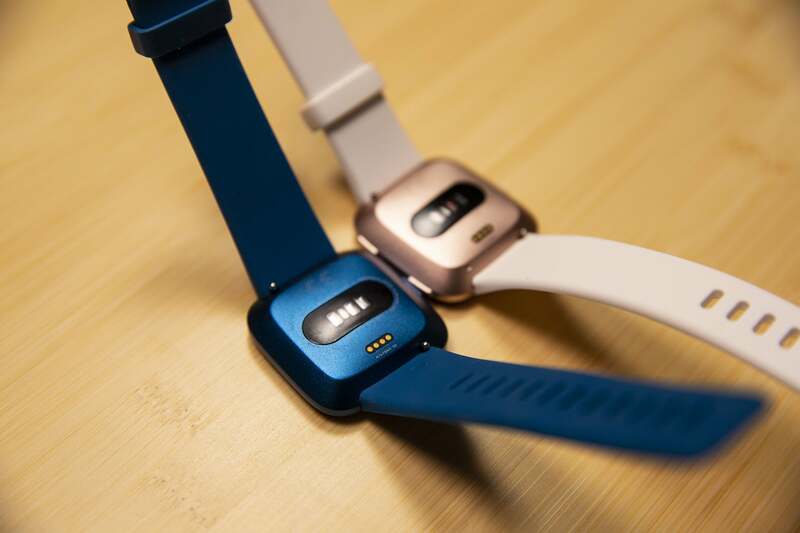 You get the same four-day battery life, connected GPS, customizable exercise modes, and heart-rate monitoring, as well sleep, female health, and automatic activity tracking. The only slight inconsistency I found when compared to the original Versa is with the heart-rate monitor. To get the most accurate reading, I had to wear it about an inch higher on my wrist than with other smartwatches, lest I get a consistent reading in the mid-80s, even when exercising. The Versa Lite is missing a few fitness-related features, but most casual athletes won't notice. All of the clock faces and most of the apps are present as well, including a couple new ones to match the Lite’s specific body colors. Now on version 3, Fitbit OS has come a long way in a short time, but the advancements aren’t in terms of apps. While they load just as quickly as they do on other platforms, apps on the Versa Lite are still overly simplistic and mainly a matter of occasional convenience on the Versa Lite rather than a necessity. None of the apps I’ve used outside of the fitness stuff and timers are necessarily essentially to the Versa experience, and quite frankly, they probably never will be. More than a year in, it’s clear that Fitbit isn’t trying to compete with watchOS or Wear OS when it comes to functionality. 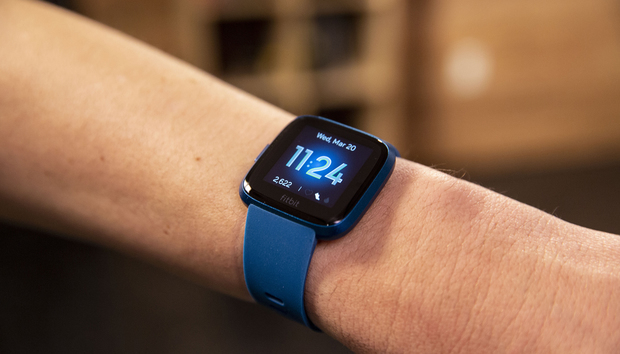 Like the rest of Fitbit’s devices, its smartwatches excel are when it comes to fitness tracking, and the Versa Lite doesn’t skimp where it matters most. The excellent Today screen is still available by swiping up from the bottom of the screen, and you’ll see all of your stats (minus floors climbed) without needing to jump into a separate app. Like the rest of Fitbit’s smartwatches, the Today screen is my favorite feature of the Versa Lite and the main reason to choose it over any other band. If you’re in the market for a new smartwatch, Fitbit should certainly be a consideration. While the apps and functionality pale in comparison to the Apple Watch and even Wear OS watches, they nail the basics, offer fantastic fitness tracking, and look as good as their competitors. The bundled apps are all you'll need on the Fitbit Versa. On top of all that, the Versa Lite brings tremendous value. While the Versa wasn’t exactly expensive at $200, the Black Friday deals that brought it down to $150 practically made it an impulse buy. With a starting price of $160 and nearly all of the same features, the Versa Lite is a perfect entry-level smartwatch for people who aren’t looking to pay hundreds of dollars for an Apple Watch but still want something that’s versatile enough to wear while working or working out. Unless you absolutely need to track floors climbed or store music, the Versa Lite is the smartwatch to buy. Even if you opt for good old-fashioned silver.